The Aefina Method is based in co-design principles that aid healthcare transformation through developing collaborative relationships with patients and all team members. The Method works with established leaders or emerging, high potential leaders; it also offers a productive path for physicians or other clinicians who are striving or struggling to engage with patients and colleagues. The Aefina Method uses a disciplined approach to create partnerships with healthcare organizations and individuals to achieve exceptional results. The Aefina Method is rooted in the principles of reliability, engagement, safety science, and human centered design with processes and performance metrics. Our partnerships are based on intentional commitments, mutually agreed on plans, specified accountabilities and outcomes, defined milestones, purposeful interactions, and measures of results. The Aefina Method goes well beyond a consulting relationship. Rather it is a process that involves collaboration and leads to optimal performance for the participants and organization. 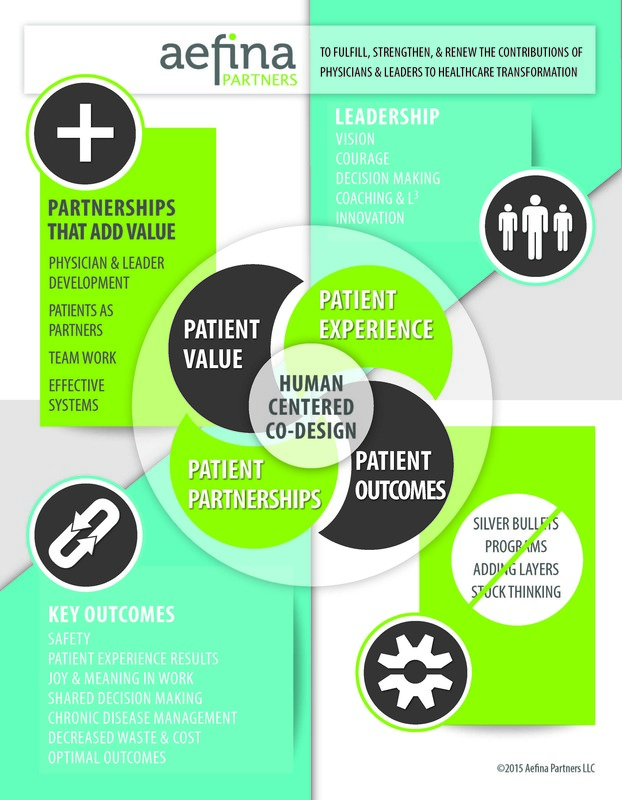 We understand the complex context and challenges of healthcare. We believe that in healthy organizations individuals are accountable for their performance and leaders are accountable for systems that enable success.